This month, we have original fantasy by Megan Arkenberg (“The Huntsman”) and Christopher Barzak (“Paranormal Romance”), along with fantasy reprints by Theodora Goss (“Princess Lucinda and the Hound of the Moon”) and from Shawn Speakman’s new all-star charity anthology, Unfettered, we have a new story from Carrie Vaughn (“Game of Chance”). 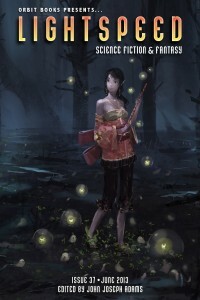 Plus, we have original SF by Sarah Grey (“The Ballad of Marisol Brook”) and Sylvia Spruck Wrigley (“Alive, Alive Oh”), and SF reprints by Paul Park (“Get a Grip”) and Ken Liu’s current Hugo Award finalist (“Mono no aware”). And of course we have our usual assortment of author and artist spotlights, along with feature interviews with bestselling authors Nalo Hopkinson and Robert J. Sawyer. For our ebook readers, our ebook-featured novella is “The Fool's Tale” by L. Timmel Duchamp, and the featured novel excerpt is from Abaddon’s Gate by James S. A. Corey.